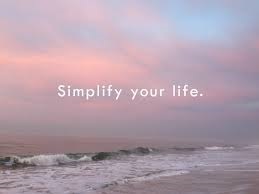 As you know from the previous post, the first week of August is National Simplify Your Life Week. Simple living is different for each person, but in general, a simplified life means that you are getting rid of clutter (both mental and physical) so that you can have more time and space for the things that you enjoy. This is a week to think about what you enjoy in life as well as getting rid of the things you dislike. Make a Personal Inventory– Make a list of activities or objects that fill your days. You might discover that you expect a lot of yourself. What responsibilities would you be willing to remove or reduce in your ideal world? Practice gently saying no– Gently saying “no” to additional responsibilities may feel awkward at first, but in order to simplify your life, we must say “no” if we are taking on projects or tasks out of a feeling of guilt or obligation. Thankfully, in this day and age, assistance is available if you have assumed responsibilities. For example, food subscription services can help with meal prep, or professional organizers can come into your home and help you declutter. Remember, you do not have to do everything yourself! Additionally, the Bellevue University Library can help you by providing excellent resources. A few of our resources are listed below. Happy Simplifying!